Hanover Borough Police are seeking the public's help in identifying a man who they say robbed a bank Saturday. Hanover Borough Police are seeking the public's help in identifying a man who robbed a bank at gunpoint Saturday morning in the borough. Police say that shortly before 9 a.m., a man entered the Adams County National Bank at 1127 Eichelberger St., displayed a silver semi-automatic handgun and demanded the tellers to place money into a bag. After receiving an undisclosed amount of money, he exited the front doors of the bank and fled on foot toward Eisenhower Drive. No one was hurt during the incident, according to police. The suspect is described as about 5-foot-8, with a slender build. He was wearing a blue and green sweatshirt-vest type jacket and possibly a red and white shirt underneath, police said. 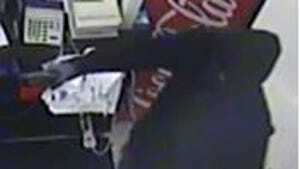 He also was wearing a dark-colored face mask, red gloves, blue jeans and dark shoes. The jacket had gray sleeves,drawstrings and a hood, which he wore over his head, according to police. Hanover Borough Police are looking to speak with the owner of a dark blue or purple hatchback vehicle that was seen driving through the bank's parking lot shortly before the robbery to determine a potential connection with the crime. Hanover Borough Police are asking anyone with information on the suspect's identity or whereabouts to contact them at 717-637-5575 or through York County 911.